Having wanted a new white top for what seems like aaaaages, it may be the end of summer but am loving this one to pieces! A simple little thing really, but checks off all the boxes of a classic top to me. Before we talk patterns and fabric, first let me share the story behind this cute top, as every handmade garment seems to have a story to tell. The Upstate South Carolina county where I live, has a lot of needs. A few years ago a group of Christians felt led to form a non-profit faith-based group called The Dream Center to do something to help the homeless by giving them a 'hand-up', not a 'hand-out'. Their methods have shown success, and they have recently built a small subdivision of tiny houses called Opportunity Village where the homeless, and people in need, can live while they take classes to learn necessary 'life' skills, find employment and get on their feet. They are funded by donations and their Resale Centers, i.e. thrift stores, one of which opened up in my little town recently. A few weeks ago I decided to stop in and check it out..... and boy am I glad I did! You know how there are great thrift stores, and not-so-great thrift stores? 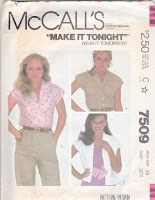 This is a good one and I lucked out and found the vintage pattern McCall's 7509 in my size for all of 10 cents! Thrill! For 10 cents I did not take the time to check out the pattern tissue until I got home, and incredibly all the pieces were there and in great condition. Someone had already carefully cut them out, so this top swept to the top of the queue and was started that very same day. Not sure about the 'Make it Tonight, Wear it Tomorrow' slogan there, but it was done in a couple of days which is pretty quick for me. I made a size 10 with no modifications other than sewing 3/8" seam allowances at the side seams. As a note... the markings were made with tracing wheel and yellow marking paper which did leave marking lines on the fabric that thankfully all washed out. As soon as I finished the top it went in the washing machine and I held my breath! Here's a better view of the line drawings. The description reads "Buttoned blouse A, B or C has extended shoulders forming cap sleeves. Blouse with revers and C with shawl collar have slit in sleeve seam." Oooookay, what in the world is 'revers'? Thinking it was some sort of typo it was interesting to learn Google defines it as meaning 'the turned back edge of a garment revealing the undersurface, especially at the lapel'. 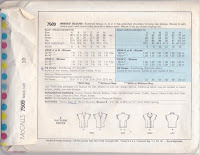 Initially cut out View B with the revers collar and no slits in the sleeve seams, then changed my mind and found it ever so easy to cut out the shawl collar from view c. The 2 front and back darts are optional, but that was a big draw for me. My waist is small and these darts help tremendously with a good fit for me. 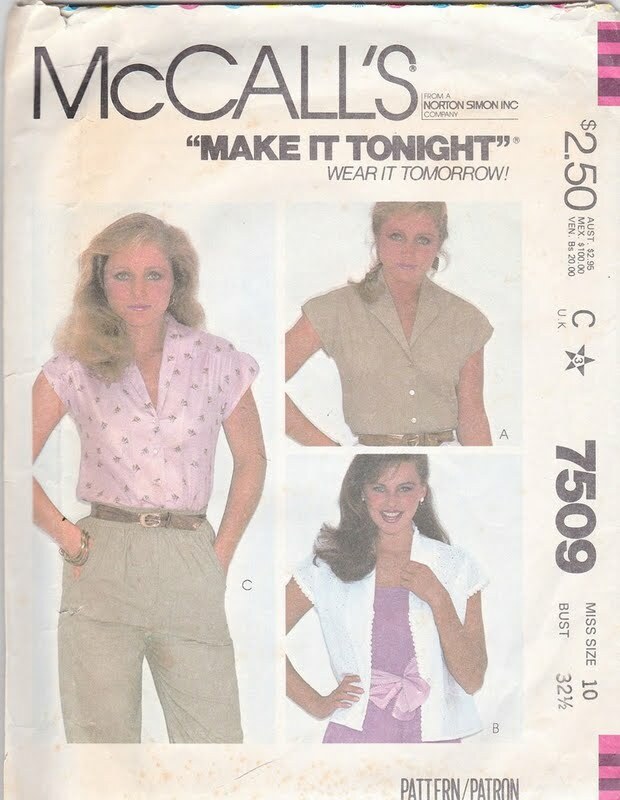 With a 1981 copyright date, it reminded me of some favorite tops I wore back then. At the same time it also gave me pause because I didn't want to wear a top that looked 'dated'. In the end decided it had a classic vibe and was delighted to find it made up as such. Wearing it untucked here to show you how the top lays and found I really like wearing it this way! Love those front and back darts! When I make this again am thinking to add a small slit at the bottom of the side seams. This collar is a great collar. It is a flattering design and lays not too high, nor too low. The pearl buttons came from the stash and it wasn't until I was searching through the mountains of buttons I've inherited from my mother and grandmothers that I realized this is the first garment I've ever made that incorporated buttons and buttonholes. This shirt requires four 3/8" buttons and can you believe there was nary a flat white or clear 3/8" button to be found. I wanted a casual look and initially was afraid the pearl buttons would be too 'dressy' but now think there are perfectly perfect. Love 'em! Interior seams are serged. The fabric was purchased in June 2017 when I was on a mission to sew all new white tops for summer (of which I am woefully behind!) and purchased 4 different white fabrics from JoAnn's. All were different blends and all were white and I fretted about remembering which was which, so when I took my perfunctory photo of the end of bolts for future reference, I carefully stacked the white fabric cuts in the same order. These quick photos of the bolt ends have come in so handy to refer back to of fabric content and care. Ummmm, like in this case I remembered this was White Chambray so in my mind, as I was sewing it up, I thought I would be wearing 100% cotton. It wasn't until I was really 'feeling' the fiber of the fabric and had worn the top for the first time I thought this does not 'feel' like cotton. When I looked back at my photo, which I've isolated the bolt end here below, I realized it wasn't cotton at all. It was 100% Lyocell. Whuuuttt??!!! Another new word! Simplifi Fabric defines Lyocell as 'eco-friendly', 'from nature to your closet', 'a natural man-made fiber from wood pulp'. I'm wearing wood pulp?! Oookay. Reading on.... Lyocell is more moisture absorbent than cotton, has natural breathability, is 100% biodegradeable with beautiful drape and great for sensitive skin. The drape was what drew me to this fabric. Wikipedia has a more technical description if you are interested in more info. It is also known as Tencel. After learning about Lyocell I am amazed it's not more widely available, or known, here. This was a big first for me. Anyway, I probably had some sort of coupon and paid less than $12.99/yard but it is still available at JoAnn's and on sale for $6.49/yard and you can see it here. This top takes @1 3/8 yards. 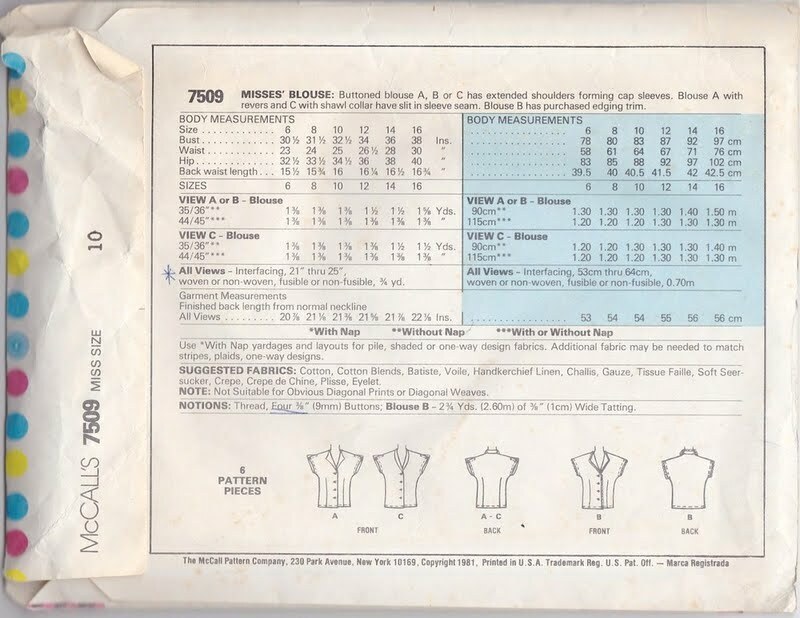 One more thought about this vintage pattern.... it was nice only dealing with the one-size printed tissue pattern with well written instructions in large step-by-step order. Overall, thoroughly enjoyed the process of making this top and it has triggered an interest in vintage patterns, as I've not sewn from them before. Wearing it with the floral linen Belize shorts. Also wanted to show how nice it looks all tucked in with the Alabama Chanin modified 6-panel skirt. The top's front and back darts line up nicely with the skirt's front and back panel seams, as well as helps keep everything nice and neat and tucked in and not all blousy at the waistline. The only drawback to wearing it tucked in is the bottom pearl button sometimes shows through if the skirt is more fitted there. This skirt works fine. .......turn to dark for a couple of minutes this afternoon as the Moon blocked the Sun's rays in full. My daughter, Melissa, and I enjoyed the moment together at the top of one of our deck stairwells where she snapped this photo of our automatic lights that came on in the darkness. We've had such a flock of visitors to our area for this event it has caused gas shortages and certain food product shortages, like bread, in our grocery stores. Hotels have been sold out for weeks, schools and lots of businesses were closed. Am so thankful to have experienced this once-in-a-lifetime event with my sweet daughter. I agree, this is a totally classic blouse, and you will wear it a lot. Lyocell, Tencel, Rayon - all made from cellulose - either wood pulp, and sometimes recycled cotton. It's a very cool fabric to wear as it absorbs a lot of moisture. Just not as hard wearing as cotton, and much more slippery to sew. The eclipse is amazing - looks quite spooky. Your blouse has got lovely details and is spot on. Never can have enough white blouses. I love reading your stories behind your makes! Tencel or Lyocel is seen more and more in RTW here. I haven't worn it yet but your definition sounds like one of a perfect fabric. The eclipse moment is surreal and a little frightening, no? Your new blouse is the farthest thing from "dated!" It's a beautiful style on you and I'm sure you'll be wearing it a lot. (You look good in wood pulp. ;o)) Love the cap sleeves on you. I've seen Tencel clothing advertised in all the ready to wear catalogs and it seems very expensive. As an absolute lover of all things vintage, I think your new blouse is perfection. The collar is lovely as is the fit. It's nice to see it dressed up and down too. I am rather partial to tencel and its variations so can appreciate this fabric. Your eclipse experience looks epic. Great post Lisa. Perfect white top.. So cute with the shorts, and so cute with the skirt.. Great find at that thrift store. How wonderful that the ladies started the "hands up" idea.. Love to hear those kind of stories. Thanks for sharing. It's very beautiful! I can't believe that pattern is vintage. I thought it's a new collection. You are so talented! So many lucky finds! First the pattern then the lyocell fabric! The blouse is very flattering on you, I like the collar a lot! What a big event the solar eclipse was! And how dark it got. Marvin is in NC at the moment and sent me photos, but it wasn't nearly as dark there! You have sewn a beautiful classic white blouse and the lyocell sounds like it would be lovely to wear. I think some of the older patterns are real treasures. How lucky you were to experience the total eclipse especially with your daughter.